So many riders, so little time! That’s the feeling you get when you show up to ride at many “dude” ranches. At such operations, riders are often mounted as quickly as possible on unresponsive horses, and are given little or no instruction as to proper riding technique. The horses are trained to follow each other down a predictable, unchallenging trail, ignoring as much as possible the riders on their backs. And no wonder! The mixture of signals they receive, intentional and unintentional from the uninformed, unaware riders would drive a sensitive horse to its wit’s end! The long string of riders arrives back at the barn- safe, (this is good), and having probably seen some nice scenery, (also good), but, wait! Is this really riding? At Hill Country Equestrian Lodge, we think not. We believe a great part of the pleasure of riding is the magical interaction that occurrs between an aware rider and a responsive horse. That’s why we take the time to give each rider a brief tutorial before you leave the corral, and we continue to help you with tips all along the way. Our groups are also kept small- no more than 5 riders per group- so that we can do more creative and challenging things on the trail without sacrificing safety. You don’t have to have a great deal of riding experience when you arrive, just a willingness to learn and to be attentive throughout the ride. After all, you want your horse to pay attention to you, too! When our horses are not busy serving our guests, we keep them in good form through regular work-outs and tune-up training. This keeps them fresh, responsive, and fit. And we teach riding lessons and clinics year-round, so those who wish to further improve their horsemanship skills while they’re here have the chance to do so. (See the Riding Clinics page/link for more information on our Whole Horsemanship Clinics). It takes more time, effort, and skill to run a riding program the way we do it, but we think it’s worth it. So do our very special group of horses. (Read more about them on their own page/link- “Our Horses, Our Stars”). We all think you’ll agree. 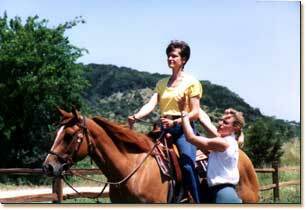 Come experience the difference for yourself with rding and instruction at Hill Country Equestrian Lodge! Note: A maximum weight limit of 225 lb. 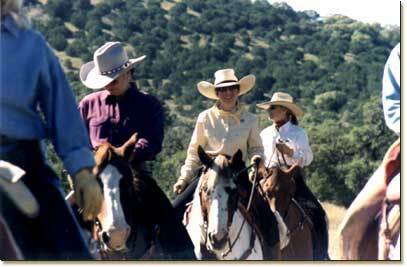 is required for riders of Hill Country Equestrian Lodge's horses. 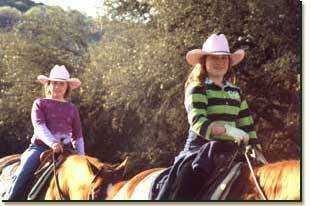 Trailrides, Lessons, and Clinics are reserved for our overnight guests only.